Ever consider doing the grapefruit diet? Who wouldn't try a diet that promises a 10-pound weight loss in 12 days? Indeed, a few decades ago it seemed everyone was trying it. Years later, the grapefruit diet has made a comeback with many versions circulating the landscape of the dieting world today. In the 1970's, the grapefruit diet ignited a whole new idea about weight loss. Although nobody has claimed its purported fame, the diet allegedly works due to an enzyme inherent to the fruit that acts as a "fat-burner." 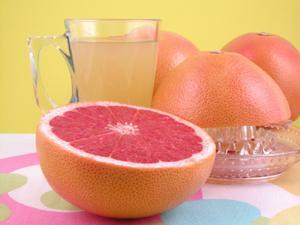 Likewise, this enzyme is found only in grapefruit, which is most likely the only truth to the diet. The original plan instructs consuming half of a grapefruit or four ounces of grapefruit juice with each meal. Meals are not to be skipped and a bedtime snack is allowed. For the most part, suggested meal plans include meats, vegetables and eggs with a total of approximately 800 calories per day. No exercise is required, but you do need to follow a menu specific to the diet plan. The newest version, also known as The Grapefruit Solution (2004), strongly recommends an intensive exercise regimen in conjunction with the grapefruit dosage at each meal. Grapefruit capsules are available for those who cringe at the thought of eating grapefruit or drinking its juice. This latest adaptation of the diet also advises healthy, balanced, reduced-calorie meal plans. Dieters also have the option to follow any one of today's popular diets such as Atkins or South Beach. At one time the Grapefruit Diet was also called the Hollywood Diet. The two diets were one and the same. Today there is a Hollywood Diet that differs from the Grapefruit Diet. The new Hollywood Diet is a 24 to 48 hour cleansing diet that requires the drinking of a miracle juice product. Like the Grapefruit Diet, the Egg Grapefruit Diet is also supposed to be followed for 12 days. The other thing they have in common is the consumption of grapefruit. Like the original diet, the egg variety of this diet has splintered into various versions. The strictest guidelines of the Egg Grapefruit Diet menu includes hard boiled eggs, grapefruit and little else, while the the original version was closer to the classic Grapefruit Diet. The Mayo Clinic Grapefruit Diet is the Grapefruit Diet by another name. Somewhere along the line, someone decided to add Mayo Clinic to the name of the diet, but it is in no way associated with the Mayo Clinic and is not endorsed by them. The Atkins Grapefruit Diet is not part of the Atkins brand. This diet follows the same menu as the traditional Grapefruit Diet, which means the recommended menu is in direct conflict with the Atkins Diet which limits carbs. For example, during the induction phase of Atkins, dieters are allowed 20 g of carbs per day. On average, one grapefruit surpasses that limit. That's why during the induction phase of the Atkins Diet, no fruit is allowed. The grapefruit diet, like most weight loss plans, limits food choices and total calories consumed each day. As a result, weight loss is likely to occur. By itself, eating grapefruit at each meal is not the magic behind a slimmer waistline. Research has not shown the grapefruit enzyme to hold any fat-burning properties to cause weight reduction. WebMD outlines a single study performed by the Florida Department of Citrus that resulted in weight loss. It was inferred by researchers that a reduction of insulin levels caused by the consumption of grapefruit promoted the significant loss of weight exhibited by participants. Insulin regulates blood sugar levels and fat metabolism on the cellular level. Hence, a small amount of truth to grapefruit's ability to promote weight loss continues to be under investigation among researchers. Grapefruit is a powerhouse when it comes to packing in vitamin C and beta-carotene. Both of these components have been proven to fight diseases, mainly cancer, by acting as antioxidants. Hence, grapefruit consumption is not a harmful act and may prevent major health conditions. The restrictive calorie regimen attests to the diet's unhealthiness. As reported by EverydayDiet.org, any eating plan promoting less than 1200 calories is not safe or healthy. Additionally, the 1200 calories need to be acquired from all the food groups to ensure adequate functioning of the body's systems. According to the Mayo Clinic, grapefruit has been shown to interfere with certain medication absorption in the intestines. The fruit contains a compound that blocks the enzyme responsible for the natural breakdown and absorption of many prescription medications. The result is a potentially toxic level of the medication in the blood system that can lead to serious side effects. For this reason, it is critical to talk with your primary care physician before embarking on any diet.